Jeff Tomlinson, instructor with General Dynamics, supervises 25th Infantry Division soldiers as they learn how to maneuver the 19-ton, eight-wheel Stryker combat vehicle at Schofield Barracks East Range. 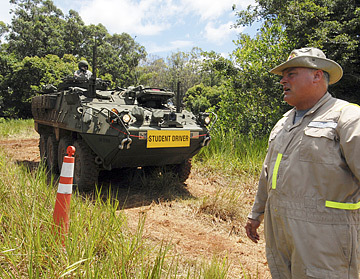 THERE IS a lot of activity behind the fence line at Schofield Barracks' East Range just a few miles from homes in Wahiawa, and all the action centers around the Army's newest Stryker combat vehicles. But because these 19-ton, eight-wheeled, diesel vehicles are so quiet, it's nearly impossible to detect them running up and down the 14.5 miles of dirt roads in East Range. And because the Army plans a series of connecting military training roads from Schofield Barracks to Dillingham Air Field and the Kahuku Training Area, the public may never see them. Col. Chris Miller, director of the Stryker Fielding and Army Transformation Team for Hawaii, said the 25th Infantry Division's 2nd Brigade eventually will get 328 of these combat vehicles that can be outfitted in 10 different ways, with everything from a 105 mm cannon for a mobile gun system to a wireless command center. There are already 59 here, with an additional 39 being prepared for shipment to Hawaii at Fort Lewis in Washington. Each Stryker costs about $1.5 million. One of the jobs of Miller's headquarters in Warren, Mich., is to coordinate the purchase and the placement of these combat vehicles from its manufacturer, General Dynamics. Each of the Army's new brigades cost close to $1.5 billion, and the Army wants to build seven of them. "The first Stryker brigade was located at Fort Lewis, so it made sense to keep everything going there," Miller said. The Strykers are assembled in London, Ontario, and Anniston, Ala., and transported to Fort Lewis. "It's a constant flow," Miller said. Ron Borne, director of transformation for the 25th Division, said Stryker crews spend the first few weeks at East Range learning how to drive the vehicle. Once the crews learn to operate the Stryker under all conditions, including with night-vision glasses, the next step is learning to fire its weapons. The last step is training as a company. That may happen late next year at the National Training Center in the Mojave Desert near Death Valley, Borne said. The 2nd Brigade would deploy to the desert, taking with it all of its vehicles. Pvt. Wendel Brueckner said the Stryker handles "much smoother" than a Bradley tracked armored vehicle. "It doesn't jostle around because it has better suspensions," said Brueckner who is licensed to drive a Humvee, a Bradley and a large truck. Brueckner said the Stryker handles "like a car." Capt. Jeremy Clardy, commander of Alpha Troop, 5th Squadron, 14th Cavalry Regiment, said one of the Stryker's major features is "it's so quiet." "We can get in and out quickly and quietly," Clardy said. The 13 Strykers assigned to Clardy's unit are reconnaissance vehicles. "We are equipped with a long-range advanced surveillance system that identify objects using thermal sights about 10 kilometers (6.2 miles) away," Clardy said. Borne said the timetable to get the 2nd Brigade with its Strykers and 3,850 soldiers operational has slipped from May to November. "We needed to reset because what was going on in Iraq and the fact that we had to prepare the division to go to Iraq this summer," Borne said. But the slight delay has not affected the progress of 28 construction projects, estimated at $693 million, planned for Oahu and the Big Island. On Thursday, the Army settled with Parker Ranch and will pay $31.5 million for 2,400 acres near the Pohakuloa Training Area. He said construction is nearly complete on a $50 million Stryker motor pool and five pistol, rifle, machine gun, sniper and mortar-firing ranges at McCarthy Flats at Schofield. The ranges cost $8 million. Another $32 million was spent to build a battle-area complex where 39 Strykers and other vehicles fire live ammunition during combat maneuvers. The Stryker, named after two Medal of Honor recipients, is the brainchild and legacy of retired Army Chief of Staff Gen. Eric Shinseki. The vehicles are much lighter than the 67-ton M-1A1 Abrams tanks and conceived to be easily deployed. They are the first new Army vehicle to enter service since the Abrams tank in the 1980s.